After almost a decade long rule in Pakistan, Musharraf had agreed to consider conducting of elections in Pakistan in the year 2008. People of Pakistan who were fed up of military rule welcomed Benazir Bhutto, who came back from self exile in London to contest in election, with slogans like long live our leader, daughter of the East (As she is known to the world). But the public had no idea that the country which had almost converted into the breeding place of home grown terrorists will eat their own leader. She was shot on 27th Dec, 2007 at the end of the rally, but the main reason of her death was the explosion that caused her head to strike the roof of the vehicle just after the rally was over. Sooner or later nobody took responsibility of the assassination. The case was also looking as if it has frozen. Some class of people started believing that it might be her husband (Asif Ali Zardari, current President of Pakistan) who got her killed to become President of Pakistan. Musharraf refused to help much on this case, and set himself in exile in London. At this, theories started to build up of possible involvement of Musharraf in the case of Benazir Bhutto’s Assassination. Soon he was named as an “absconding accused”, by Federal Investigation Agency of Pakistan. 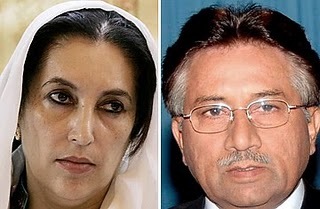 Recently during the hearing of Benazir Bhutto’s assassination case on Saturday 26th March, 2011 in Adiala Jail, The Federal Investigation Agency’s counsel told the court that letters had been sent to the British home ministry to issue a arrest warrant against former President Pervez Musharraf. Musharraf, who has formed a political party (All Pakistan Muslim League) with the plan of contesting in next proper democratic election in 2013, will now find it difficult to do so. Scroll down if you are looking for the comment form, your comment is very much appreciated! !